From Tinseltown to the Big Apple, amazing duos abound. Paris and Nikki, Ashlee and Jessica, and of course our favorites, MK and A. So alike yet so different, these sisterly combos are the flip side of the same coin. The ORLY Truth or Dare Fall 2005 Color Collection is inspired by these swank pairs. This ensemble of 6 complementary color duos consists of one sweet pastel and one edgy dramatic shade. So while Ashley might be seen on the red carpet wearing the crisp, winter white shimmer of Come Clean, Mary Kate’s lacquer of choice would most definitely be Talk Dirty ebony metallic. Color collection that strengthens overtime. Six sophisticated yet seductive crémes that are versatile enough to transition from day into night. The lacquers are also infused with the power of special built-in strengtheners. Use these two-in-one formula colors with a high-shine topcoat like Sec 'N Dry and you are ready to go! Twelve bling-bling shades that represent a birthstone and mood for every month of the year. 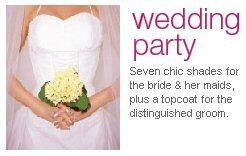 Seven chic shades for the bride & her maids, plus a topcoat for the distinguished groom.